The Experiment Advisor provides experiments the ability to detect design and timing errors in E-Studio and E-Run. Additionally, statistics on the OnsetToOnsetTime, OnsetDelay, and LoadTime of objects can be reported. The Experiment Advisor tab is accessed through the Experiment Object as seen in the image below. 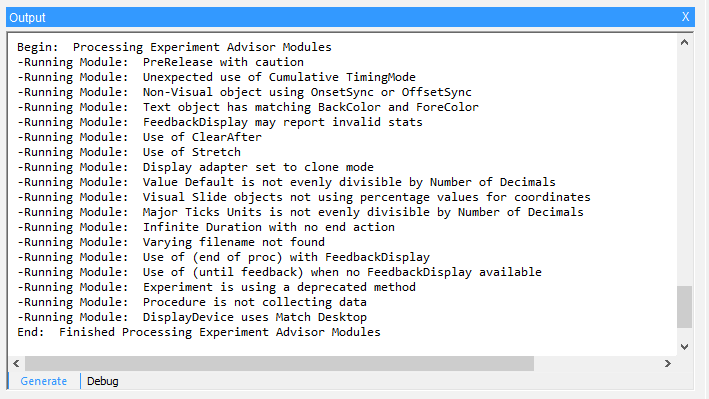 While in the Experiment Object > Experiment Advisor menu, if the Experiment Advisor Modules list box is in focus, the modules can be checked (or unchecked) using the spacebar. Additionally, the Experiment Advisor Modules can be arranged in alphabetical - or reverse alphabetical - order by clicking on the "Module" header. When generating an experiment, Experiment Advisor generates a report. If any of the enabled Modules have a finding, then it reports are shown in the Advisor window. When running an experiment, Experiment Advisor generates a report. If any of the enabled Modules have a finding, then they are shown in the report. The report is opened in the default application for .xml files. 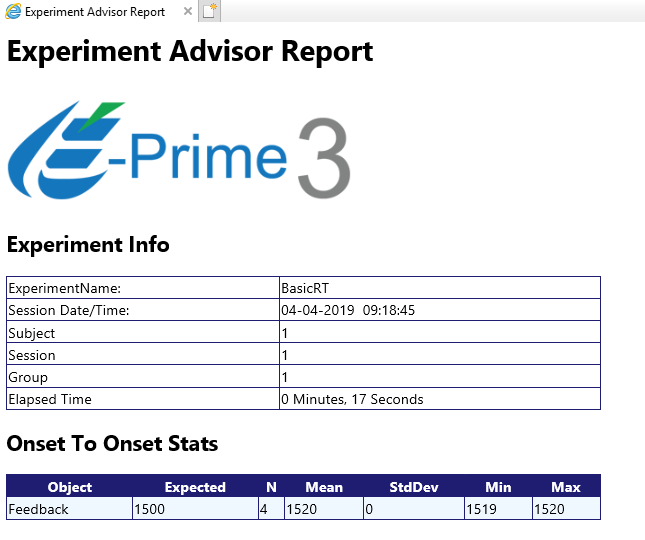 After an experiment run, the link to the Experiment Advisor Report and other data files are available in the Generate tab of the Output window. 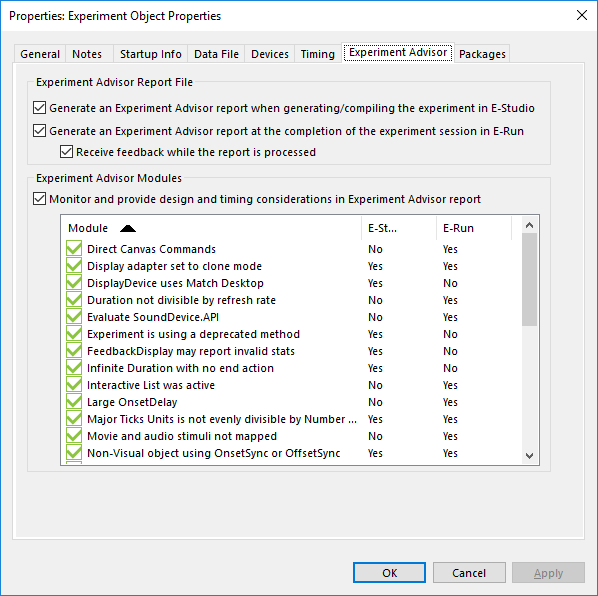 The Experiment Advisor Report can include statistics about the LoadTime, OnsetDelay, and OnsetToOnset of E-Objects that occured during an experiment run. Check boxes for these options exist on the Experiment Advisor tab of each E-Object. All of the options are disabled by default. 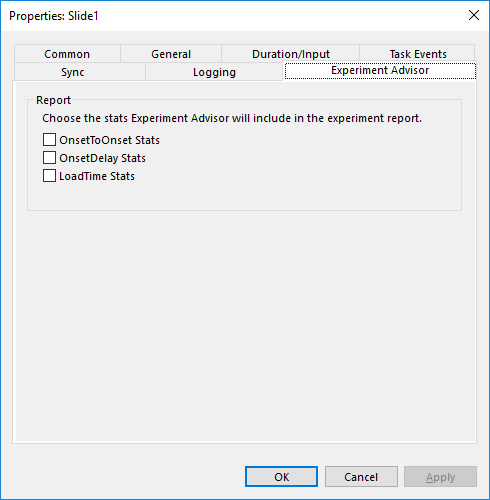 When any check box on the Logging tab is altered or the Data Logging drop down on the Duration/Input tab changes, then the Experiment Advisor properties become checked. When individual modules of Experiment Advisor run at the end of an experiment, the "Generate" tab of the Output window lists each of the tasks as they occur in the system. For instance, "-Running Module: Non-Visual object using OnsetSync or OffsetSync" appears when E-Run reports back to E-Studio about the status of the "Non-Visual object using OnsetSync or OffsetSync" Advisor module.